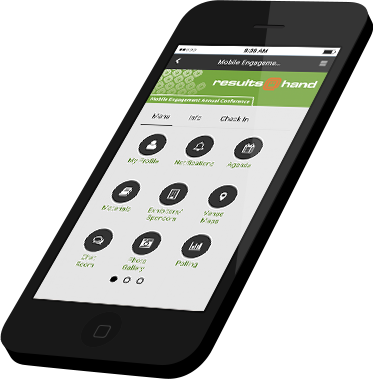 Save time and money with the Results@Hand online Event Registration tool! Bundle our easy-to-use event registration page with our event app and save! Enjoy dozens of features like interactive maps, gamification, sponsorship, on-site check-in and more. 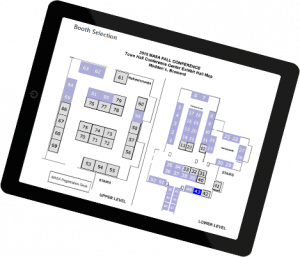 Let your vendors select the perfect booth based on its location, neighbors & price! 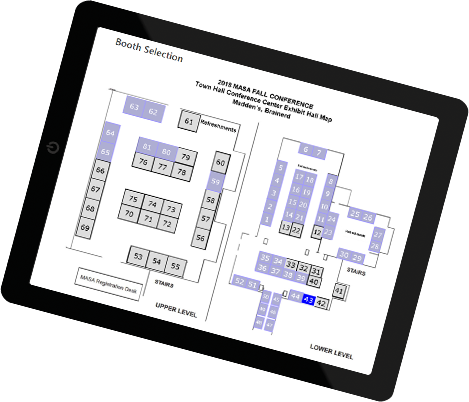 Our easy-to-use display includes a customizable interactive map that allows your exhibitors take control of their on-site presence. We know you have limited resources, so eliminate re-work by bundling our online registration website with our suite of Event Management tools and save! Our Registration system is seamlessly integrated with our mobile event app so you don't have to worry about cumbersome imports across platforms or problematic integrations. Announcing free name badges to accompany our event app! With support for a number of print-ready layouts and the ability for you to customize your own badge, the options are endless! Print a single badge last minute at your event, or use our template to print badge sheets in plenty of time prior to your event. Want differing formats for speakers, exhibitors, or attendees? You can do that - change it up! 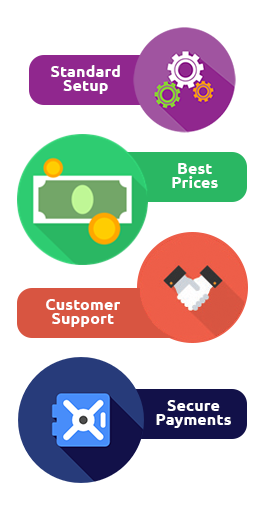 We offer a significant savings over our competitors. Request a quote to see how much you can save! Bundled pricing includes a 1% transaction fee. We don't touch your funds and bill you separately form your registration collection. Includes integration to your PayPal Express checkout account or your Authorize.net account with AcceptJS + UI. We can also integrate with other processors so you aren't limited to our standard options. 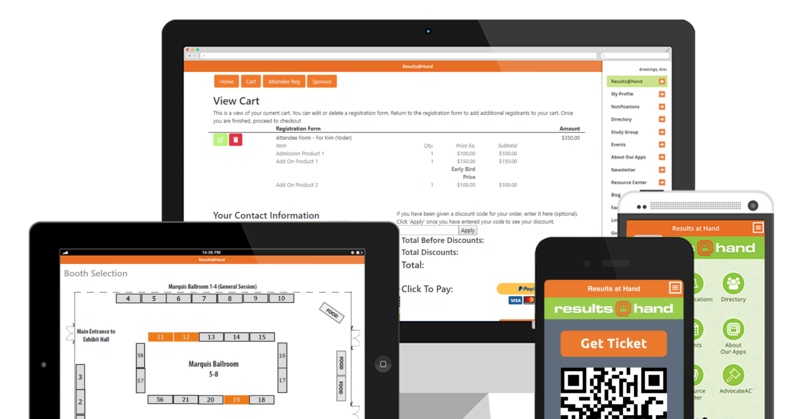 Our team of experts will lead you through your Event Registration website setup. Ready to Check out the Registration Site? Each registration website is customize-able! This registration website includes sample branding and content. 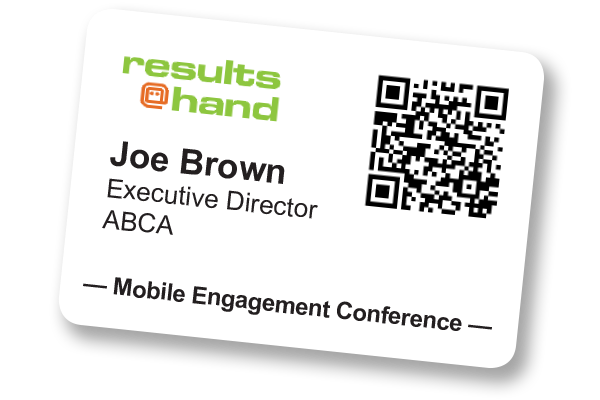 We have worked with Results@Hand to provide program apps for many conferences and we were really pleased to see them expand their services to include event and exhibitor registration. We have now had these comprehensive resources for several of our conferences and we have been very pleased. Our staff and conference participants report that using the tools is easy and intuitive, and harvesting data from the tools is seamless and accurate. And we have always appreciated the strong client service commitment of the Results@Hand staff. 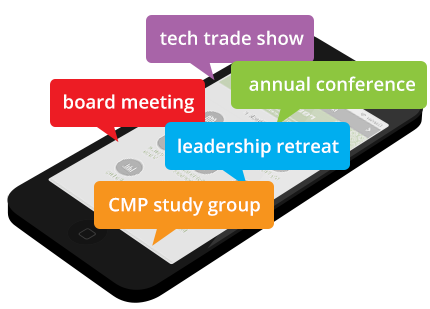 “ We have worked with Results@Hand to provide program apps for many conferences and we were really pleased to see them expand their services to include event and exhibitor registration. We have now had these comprehensive resources for several of our conferences and we have been very pleased. Our staff and conference participants report that using the tools is easy and intuitive, and harvesting data from the tools is seamless and accurate. And we have always appreciated the strong client service commitment of the Results@Hand staff. Too Many Apps for That!